Cultures around the world may vary, but one thing is common: wherever we find people, we also find cats and dogs. These education resources, lessons and worksheets aim to educate learners about the characteristics of cats and dogs and their needs as domesticated animals. 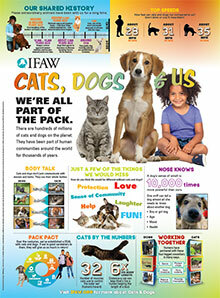 The lessons, reading materials, video and activities provide more than just facts about cats and dogs. They help learners understand the unique relationships these animals have shared with people for thousands of years. The lesson plans and activities also encourage your learners to examine and discuss the important responsibilities people have in caring for cats and dogs and the many different ways that people live with these animals around the world, from country to country and culture to culture. The teaching resources and classroom activities (at three instructional levels) include teaching guide with lesson plans, learner worksheets & magazine with glossary, classroom video, wall poster, take action guide, fun crafts and more. Please feel free to contact us with any questions regarding these materials. Visit our Teacher's Library for a wealth of free online lesson plans on animal welfare and conservation themes. To join our mailing list and order free hard copies of our education packs and videos, please register here today. Partnerships have been established with individuals and organisations whose own internal mission and objectives align closely with ours. E-classroom is one such partner, providing an online portal for curricula based educational material. They develop lesson plans from AAE themes that match school curricula requirements and are timed for release when specific themes are being addressed in the classroom. Statistic reports of the IFAW themed lesson plans show they have a high usage rate. The classroom video is an excellent introduction to the content, concepts and issues presented in the education pack and is appropriate for general youth audiences.